In this day and age, dining isn’t simply dining and food isn’t simply just food. The act of eating has been raised into a habit of joy—a tasty tidbit made up of good company and culinary adventures coupled with accessibility-slash-affordability. Over the past year, Eatigo has been serving up this purpose to comfort eaters and adventurous foodies alike in the local Metro scene. Which is why it is no surprise that Eatigo remains to be the leading online reservation platform for restaurants throughout Thailand, Singapore, Malaysia, Hong Kong and India. 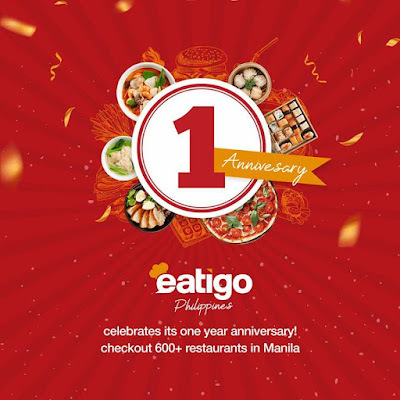 Here in the Philippines, partner restaurants have grown to more than six hundred since Eatigo made its entry in July 2017. Its user-friendly mobile app and website gives users the ease of scoring time-based discounts up to 50% off on participating restaurants—sans all other hidden charges! As it cheers to a successful year here in the country, Eatigo will soon announce an elite listing called Eater’s Choice which puts the spotlight on the high-rating and most-booked restaurants all over Metro Manila to ensure customers nothing less than top-notch dining experience. As an added treat to its loyal users, Eatigo will be giving out exciting goodies and freebies online for an entire week from July 1 to July 7, so be sure to stay updated on all their social media accounts. And to make sure App users stay glued, Eatigo vows to continue their much-raved about promos like Wow Wednesdays, where you can seize 50 percent discounts at participating restaurants on a chosen Wednesday once a month; and, Cuisine Week, where you can fully whet your appetite for your favorite regional dishes. Whether you’re up for some midday ramen, post-work chillnumans, or a hefty feast of ribs on special occasions, Eatigo has the perfect deal for you. In a world where dining out is an essential part of everyday life, Eatigo celebrates sumptuous food and the rewarding aftertaste that goes with it. With the toll of the daily grind, you deserve it.